Yore Mill towers over the famous Aysgarth Falls, and the craft shop and teashop beside it. The original cotton mill was built there in 1784 but was heavily damaged by fire in 1852. It was rebuilt in its present form a year later. The mill was used by knitters during the late 19th century with corn grinding on the ground floor. The latter continued until after the 2nd World War, running alongside the flour-rolling plant which was installed 1912. Flour production ceased in 1958 and the mill was used as a cattle food depot for ten years. It became the home of George Shaw’s Carriage Museum from 1969 until 2003. RESOLVED – That the Authority: a) supports Richmondshire District Council to secure appropriate urgent works to Yore Mill through the use of their legal powers; and b) makes public the Mill’s plight in the hope of securing a change in ownership and new funding possibilities so as to improve the chances of a comprehensive re-use in the future. 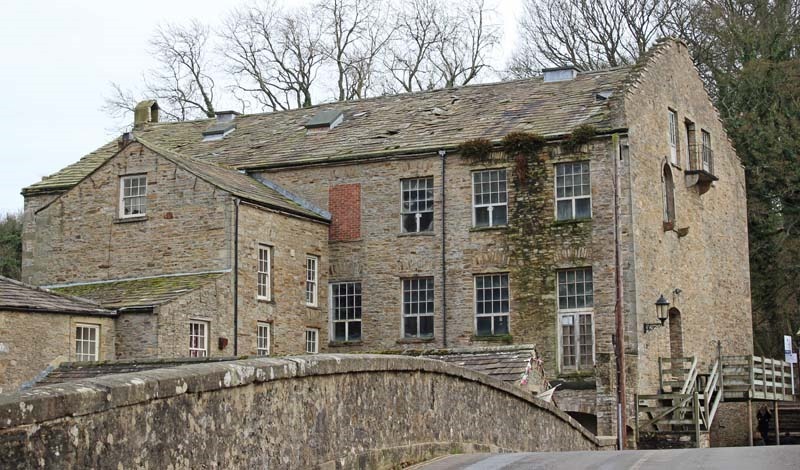 December 2016: The poor state of the roof of Yore Mill has led to the Yorkshire Dales National Park Authority (YDNPA) even considering compulsory purchase as a means of conserving this important, Grade II listed building. At the full Authority meeting on Tuesday December 20 2016 at Yoredale in Bainbridge the members will be asked to attend a site meeting with the owners at Yore Mill. The two options they will consider are: to work with the current owners to secure roof repairs by negotiation and with direct financial backing; or for the Authority to take a more forcible approach using its legal powers. The latter would require a Repairs Notice to be served on the owners which will give them at least two months to take reasonable steps to carry out a prescribed set of repairs. If that is not done the Authority would then consider compulsory purchase even though that would represent a major commitment. In a report to the Authority Thomas Harland, its planning policy officer, stated that Yore Mill was at risk. He reported: “The extent of the water damage is such that some of the structural roof timbers are beginning to be compromised, meaning that at least partial roof collapse is becoming increasingly likely. The fact that so many slates are no longer secured in position means the building also presents a risk to public safety. “The owners have ambitions to use the mill as a paid-entry visitor attraction, with retail facilities for handcrafted goods, some of which would be produced in workshops on the premises, alongside displays relating to the heritage of the Dales. “They submitted a planning application for a similar use in 2003 but this was refused due to a lack of detail of the exact nature of the use and a lack of consideration of traffic and visitor management implications of such an attraction. The lack of any on-site parking facilities remains a significant constraint. “The Authority has been in discussion with the owners since 2010 and has offered advice on potential funding streams and suitable uses. The owners have stated that they do not have the resources to finance any repair scheme.